Adam hails from the heart of Central Florida, where he grew up spending most of his time on the ocean and multitude of lakes. He traded the beaches for the mountains and moved to Vermont in 2007. After working various jobs, Adam enlisted in the Vermont Army National Guard as a generator mechanic. Alongside an 8 year military career, he decided to pursue a civilian career in the electrical trade and earned his Journeyman electrical license in 2015. He has spent the last 7 years working in the construction field performing electrical installations in residential, commercial, and industrial settings. 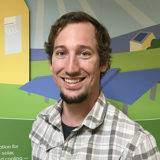 After utilizing the opportunity to perform some solar installations, Adam sought to incorporate his skills in an industry that pursues a more positive environmental impact, both locally and as part of the global equation. When he’s not out working to help fellow Vermonters, Adam teaches 2nd year electrical apprenticeship classes for Vermont Technical College. He enjoys hiking, fishing, paddling, and winter camping with his wife Lindsay and their chocolate lab, Snowflake Bentley.